It happened to the movies, it happened to video games, it's happening to board games... Sequel Mania. It makes sense financially to try to milk a product line for all its worth until its bone dry, since it's a bigger risk to try something new, but it sometimes leads to amusing results as you see how far they're willing to take a concept in an effort to avoid coming up with something new. What do you foresee in 2007? Let's all look into our crystal balls to predict the next big reinvention of the wheel. And we'll skip over the next Catan Adventure, Ticket to Ride map, and Carcassonne meeple; we can take those for granted since they're obvious enough even for amateur fortune tellers to foresee. 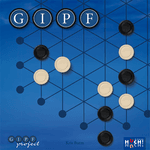 Project GIPF has brought us six fabulous abstract games, from the deceptively simple GIPF, to the frantic TAMSK, to the topple-prone DVONN, to the jumpy ZERTZ, to the flipping YINSH, to the punky PUNCT (can you tell I've only played 2 of the 6?) - but what next? Kris Burm has made all the potentials you could ever want and then some, so next year it's time for the big number seven. All great things come in sevens. Asimov's Foundation series was seven books, Dune would have had seven installments if Frank Herbert had lived long enough, and a Hogwarts education takes seven years... errr, there were more, I swear. Well, there will be more, that's for sure! When Mr. Burm releases the fantabulous NIKPFV to the world. It's got deceptive simplicity, freneticness, toppling, jumping, flipping, and punkiness... you'll surely never want for another abstract (until 2008, that is). The comparisons between Gheos and Carcassonne have been endless. There are tiles in both, and you draw the tiles from a facedown stack, and you play the tiles to build the board, and, and, errr.... I swear there were more. Oh wait, they're actually not that similar after all. But that doesn't mean that they don't have Gheos: Cathedrals & Traders & King & Count & Dragon & Tower waiting in the wings of the Z-Man vault, just waiting to spring it on unsuspecting consumers next year. You'll not only get 173 more tiles, so that you'll want to shoot yourself by the end of every game, but you'll also get 29 more wooden bits (with adorable nicknames) so you'll never be able to fit it all back in the original box. Have fun! You've travelled to Ireland, China, South America, Canada, and even to the Moon, but you ain't seen nothing yet! Next year Martin Wallace will be teaming up with Ted Alspach and John Bohrer to bring you the most fantabulous map yet, appropriately titled Age of Steam: Mongolia & Kitchen Sink. You thought you had to struggle to get your railroad into the black? You've been swimming in money Scrooge McDuck-style up until now. You thought you were excited and overjoyed when you earned that first dollar so far? Your heart will explode if you ever make a dollar in Mongolia & Kitchen Sink. You thought you had to plan far ahead and be cunning to get a 6-length delivery? Don't even dream about it, you'll be struggling to make any deliveries this time around. You think this sounds far-fetched? Well clearly you haven't seen the Sun & London or Disco Inferno & Soul Train expansions yet (no, those ones actually exist, I didn't even have to make them up). Coming off the success of the "Pillar Duo" at Essen 2006, there's sure to be another Saulen game in '07. You didn't think there could be just two, now did you? 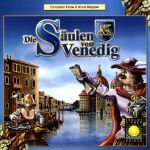 Die Saulen der Trilogy will be yet another exciting Pillar game, which will combine the excitement of a Ken Follet novel with the allure of Venice to garner itself the first ever 13.14 rating in BoardGameGeek history (i.e., the combined rating of the first two Saulen games for those of you who haven't memorized their ratings yet). Die Saulen der Trilogy will bring boardgaming into a new era of saulentasticness! Based off the unrivaled success of the recent penguin explosion, Herr Doctor will be sure to cash in with a magnum opus of his own. 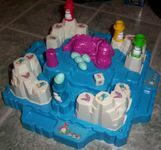 After watching both March of the Penguins and Happy Feet, playing the game formerly known as Pingvinas or Packeis am Pol, and seeing that extraordinary penguin bus stop ad, Mr. Knizia will be inspired to add his own masterpiece to the world of penguin merchandise. Entitled simply "Penguin," the game will be the definitive work in the genre of penguin classics, eclipsing such Penguin Classics as Homer's Iliad and Dickens' A Tale of Two Cities. Oh wait... that's already actually happening, nevermind. Alea Big Box #12... you know you’ll still buy it. Sick of the publishers and their silly demands, and deciding that it's high time someone introduce the Germans to one of the greatest inventions of the ? ?th century (Wikipedia didn't know, so how should I), Mr. Glenn will self-publish Balloon Cup: Piñata Edition. Spurning the advice of the all-powerful publisher, the re-release of Balloon Cup will be greeted not only by rave reviews, but also lines longer and eBay prices higher than for the Playstation 3. As a side effect of the game's sweeping success, the piñata market in Germany will be born as a craze hits the nation that has gone too long without endangering its youth with the ever-popular pasttime of making its children especially dizzy before sending them out to eagerly swing baseball bats while enclosed in a tight circle of their closest friends as they search for a sweet morsel of sugary goodness. This ain’t no Southern California area control game. This time you’ll be deploying your caballeros to the nine regions of ancient Troy as you strive to see who can control the city as its sacked by those pesky Greeks and their pesky Agamemnon. 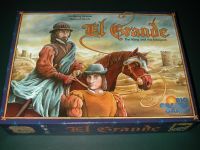 Wolfgang will be inspired by Stephen Glenn’s success to re-release El Grande: Undecennial Edition (no really, undecim is Latin for eleven, I swear) in all its ancient glory. Tossing your caballeros into the Trojan Horse will make so much more sense than dropping them into the Castillo. Virgil will be rolling over in his grave as his descendents cash in big time on the re-rebirth of the long forgotten period, with everything from Trojan Pilates to Trojan Elmo, it’s cute, cuddly and way less dangerous than taking a bath with Clytemnestra. This time you won’t have a measly 5 action points. 6 action point isn’t going to cut it either. 10 action points is still too lame. Jamexicalorres will supersede and render obsolete all previous action point games by providing players with a stunning 397 action points per turn. There will be a whopping 46 actions to choose from, and 18 different units to put on the board, which by the way is three times the size of the Battleball board. Kramer & Kiesling couldn’t handle all this on their own of course, so they called in the help of Monsieurs Moon, Knizia, Wallace, and Dorn with the meeple version of the bat signal in order to flesh out this 397-action game. Who cares if the summary card is 5 feet wide; this game will provide a hundred times as many decisions as Die Macher. You think you’ve seen analysis-paralysis, you ain’t seen nothing yet!